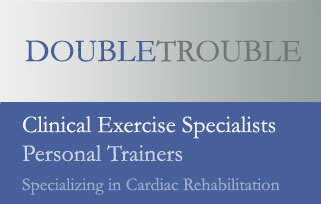 In conjunction with healthcare professionals we, as ACE Certified Clinical Exercise Specialists and Personal Trainers, will design, implement and manage exercise, physical activity and appropriate lifestyle programs for healthy individuals, or for individuals following treatment or rehabilitation for clinically documented chronic disease, musculoskeletal injury and/or disability, who are given clearance to exercise. Is tuning up your Fitness Level one of your New Year's Resolutions? Call or email Double Trouble for a Free Consultation and Get Fit Now!